As published in the Feb/Mar 2013 issue of SCOPE, the newsletter of the RASC Toronto Centre. Republished here with permission. We had some friendly banter on the RASC Toronto Centre Yahoo!Group mailing list a short while back. Radcliffe asked about a notable proximal celestial event in early January. He mentioned an asteroid but Guy and I could not find mention of any. We surmised he meant the Quadrantid meteor shower peak. In researching Near Earth Object (NEO) or Potentially Hazardous Asteroid (PHA) events, we spotted the particulars of 2012 DA14. A 58 metre spinning potato that will pass us at approximately 0.09 lunar distances. That’s around 30,000 kilometres from the surface of our home planet. To allay concerns, I assessed 2012 DA14 as "not too nasty." Scott said NIMBY*. Guy said, "pretty darn close" and pointed out that the February asteroid was twice the diameter and therefore eight times the volume of the object that exploded over Tunguska in 1908. Again I stated, not too nasty. Not an Earth-killer. 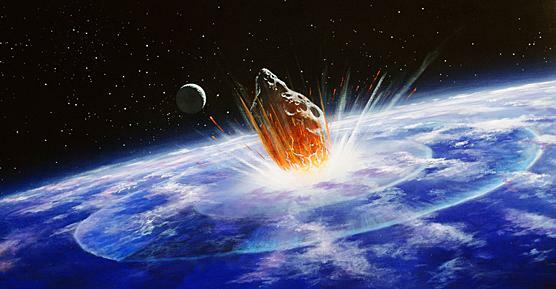 There are a number of web sites that highlight near-Earth asteroids and comets. Some of these are regularly cited in our The Sky This Month presentations. I’ve alluded to one I frequently consult in past webspotting columns. The web site by NASA, however, you might consider the horse’s mouth. The inner circle. The trusted source. The Near Earth Object Program web site has lots of information about comets and asteroids that will be in the Earth’s neighborhood over the next 100 years. The Sentry Risk Table, in particular, lists objects with the potential to impact the Earth. Unique to this list, it shows year ranges and the number of possible strikes in that time. The highly automated sentry system continuously scans for potential collisions and ranks them. Different scales are used. The Torino scale is easy to interpret: 0 or 1 is good, nothing to worry about; 9 or 10 (also shown in red to catch your eye) is bad, pack your bags. So, frankly, this column’s web site is a bit of good news/bad news. But at least you know, eh? !